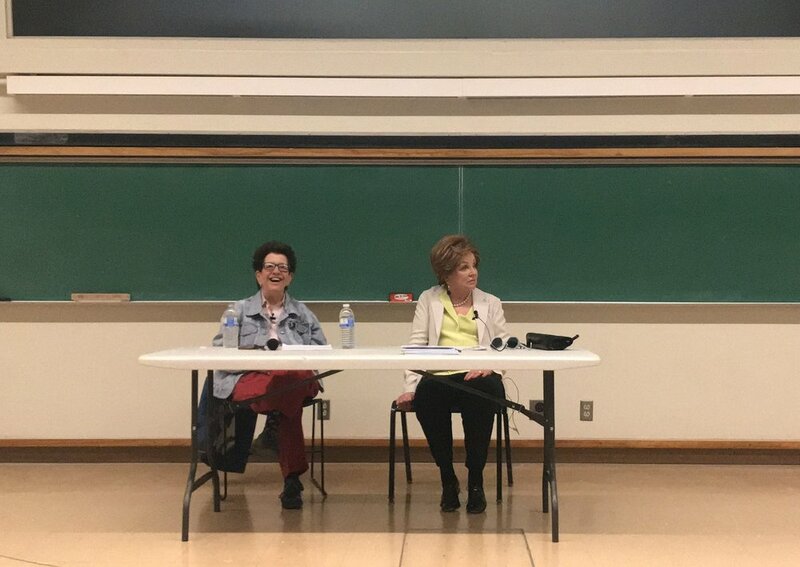 History professor Laura Kalman (left) introduces historian Jane Sherron De Hart (right), who spoke last weekend about the process of writing her new biography. Historian Jane Sherron De Hart’s new book “Ruth Bader Ginsburg: A Life” marks the first full biography written about the second female U.S. Supreme Court Justice. But the biography wasn’t an easy accomplishment. “Ruth had always said she didn’t want a biography,” De Hart said last weekend, in a talk hosted by the UCSB History Associates. De Hart is a professor emerita of history at UC Santa Barbara specializing in women’s history and gender issues in the U.S. She has published three other books about on those topics. In her talk, she discussed the challenges she faced during the 15 years she spent working on this biography. De Hart originally wanted to explore the American Civil Liberties Union (ACLU) Women’s Rights Project, which was led by Ginsburg. Ginsburg wanted the court to recognize gender-based discrimination and, through a number of legal battles, helped lay the groundwork for future women’s rights advocacy. De Hart tried looking for information at the ACLU archives and at different libraries, but found nothing. After her initial research attempts, she contacted Ginsburg personally and was granted access to Ginsburg’s personal archives and several interviews. But Ginsburg was reluctant to give her more information than what was essential. “She was very patient and helpful, but only if it was about the ACLU cases,” De Hart said. The author had wanted to talk about Ginsburg’s childhood in the New York neighborhood of Flatbush, feeling that it was important to understand why Ginsburg felt strongly about the Women’s Rights Project. But she was only given half an hour to talk about the subject and only on the condition that Ginsburg would be able to read De Hart’s notes after. “There were many tragedies she didn’t want to revisit,” said De Hart. Most notably, Ginsburg’s older sister had passed away from meningitis when Ginsburg was fourteen months old. And her mother passed away from cancer shortly before Ginsburg’s high school graduation. De Hart continued to face obstacles as she tried to interview law clerks close to Ginsburg. Many wanted to avoid displeasing Ginsberg and either refused an interview or didn’t give an honest interview about what goes on behind closed doors at the Supreme Court. Ultimately, she was able to gather enough information through interviews with Ginsburg’s husband, Martin Ginsburg, her children, friends, peers from college and professional associates. Since its release in October 2018, the book has sold over 50,000 copies. And the biography was awarded the Littleton-Griswold Prize for the most distinguished book on U.S. law and society by the American Historical Association.